NUH’s Patient Partnership Group (or PPG for short) has an important role to play. It is one of the ways in which patient views and voices are heard by the Trust to inform improvements that make a difference to patients, their relatives and carers. 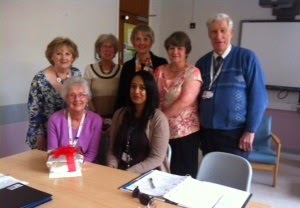 Said goodbye and thank you to Nazma Begum, the Trust’s Patient and Public Involvement Administrator for her hard work and support in organising our meetings, events and diaries over the last 6 years. Nazma has consistently supported the group and has been an absolute pleasure to know and work with. Nazma leaves NUH later this month to get married and move to Northampton. We wish her all the best for the future. Participated in the first self-assessment of the Information Standard for the Trust. This is considered to be an indicator of good quality written patient information. The Trust was among the first to be accredited with the Information Standard several years ago and continues to strive to improve the quality and accessibility of patient information, year-on-year, by working with its Readers’ Panel of which I’m a member) and patients. Commented on new information which is being developed for carers. This includes letting them know about where they can get a drink and something to eat and other facilities that they can use within the Trust.